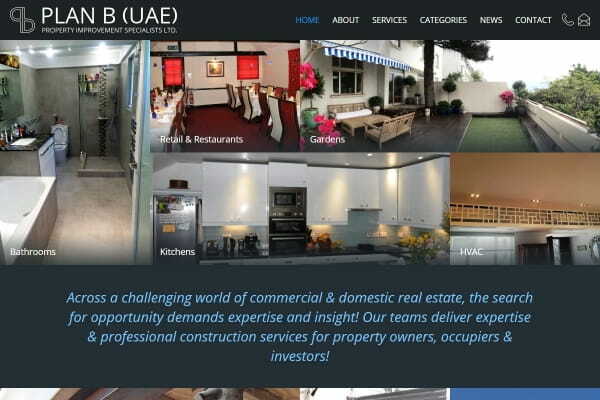 Plan B (UAE) Property Improvement Specialists Ltd. are a construction company working in the UK, Hong Kong and Dubai. I was approached to design and develop the website to a very tight deadline to coincide with the launch of their advertising campaigns. The client had some basic branding in place, and gave me some ideas as to what they were looking for which I turned into the design developed and live today. 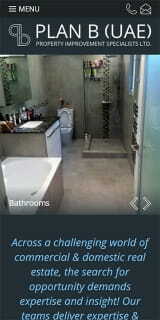 They had thousands of images across each of the areas they work in and across dozens of projects. It was important to make sure that photos were front and centre. For this I designed a new banner/collage system. Almost every page has a 4x2 grid collage, where photos can be 1x1, 1x2, 2x1 or 2x2. This allows the client to show a mix of portrait and landscape photos in an arrangement of their choosing. This was a brilliant learning experience for more advanced systems I intend to build in the future to give my clients even more control and flexibility when managing websites!